Collectics Antique & Vintage Sale Coupon: Save 10% On Entire Order! The Collectics Antiques Information & Education pages are designed to further knowledge of antiques, collectibles, collecting styles, periods, artists, designers, and manufacturers of fine and decorative arts. To learn more, our Antique Collector Bookstore lists only the best collector books and price guides, complied by surveys of top antique dealers and auction houses. 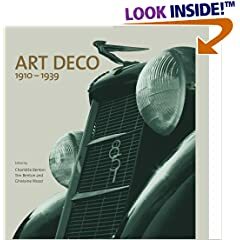 For a different shopping experience, you can also browse our featured selections in a fun new way with the Antique Price Guides Slideshow or see current Amazon.com bestsellers by using Collector Books Topic Search. Collectics Customer Appreciation Sale Coupon: Save 10% On Entire Order! Like her design predecessors in the Art Nouveau era, Miriam Haskell sought to design and manufacture jewelry that evoked nature in their subjects and construction. Haskell first began making jewelry commercially about 1924, and intensively began to create the unique flowers, animals, and other organic materials in her jewelry. Frank Hess joined her in the company as the lead artistic designer, and he was a master of new and technically complex production techniques that allowed their vision for the jewelry to come into being. Hess worked as the lead designer until he retired in 1960, and he was succeeded by Robert Clark who continued the traditions but incorporated some of his own ideas into production and used new materials such as mother of pearl. Lead designer Larry Vrba joined the company in 1970, and he more than his predecessors introduced completely new and more exotic designs that reflected the times of the 1960s and 1970s. Millie Petronzio became the first woman to lead the design department at Miriam Haskell in 1980, continuing to make some of the old designs, often with archived older materials, but as those before her continues to introduce new designs and design elements in their lines. Miriam Haskell jewelry has always been noted for the detailing, which directly translated into the time it took to make and thus the cost, and for the asymmetry of many of their designs. In the early years, Haskell jewelry was not marked and production was limited, suggesting that the proliferation of "unsigned" Haskell jewelry is questionable as to authenticity. There are of course distinct characteristics an expert looks for, including the design itself which often incorporates surprises or irregularities that one looks for. Quality was always evident, with finer quality materials and all prong set in the design. Haskell jewelry is known for its use of elaborate filigree and careful wiring, all handmade and accommodating a variety of designs. Haskell filigree was typically electroplated goldtone metal in an antique gold finish. She purchased her beads mostly from France and Venice, Italy, while most crystals came from Bohemia. The advent of World War II forced Haskell to sometimes use alternative materials including for the first time plastics, and she purchased more of her beads and crystals from sources closer to home. However, production did continue during the war years, and she introduced patriotic designs to contribute to the war effort. After the war, styles changed as soldiers returned from Europe and Asia and the women of the country awaited. Clothing once again could be made of more luxurious materials, and the designs became more vibrant, colorful, and feminine as the 1950s approached. 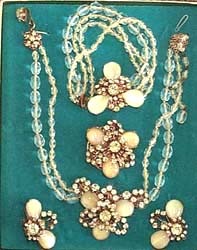 Haskell designs also became more elaborate to include larger pieces, necklaces of multiple bead strands, the use of pearls imported from Japan, and other looks largely impractical during the war. In the late 1940s, Miriam Haskell jewelry started to be marked for the first time, as fashion returned to the pages of the newspaper and designers began actively marketing their creations and growing their businesses. Several styles were used according to the design including an incised "Miriam Haskell" on the hook, "Miriam Haskell" in a crescent shaped cartouche, and an oval stamp "Miriam Haskell" on the clasp. Some designs during the fifties were incredibly elaborate, combining stones, pearls, beads, and filigree in new and exciting ways. The company was sold to Frank Fialkoff in 1990 and is still producing today, making some of the older designs such as the Retro line introduced in the early 90s as well as doing custom work. Ever been fooled by a fake or a seller that didn't deliver the goods as described? At Collectics, we authenticate and stand behind everything we sell, at prices "30% below your local antique shop" according to Collectibles Guide 2010. Please browse our main Antiques & Collectibles Mall to find a treat for yourself or a great gift for others, all with free shipping. Thanks for visiting and shopping at Collectics! 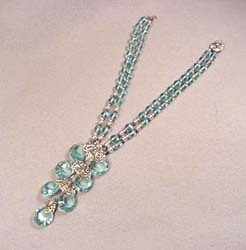 Buy period Miriam Haskell, Eisenberg, Trifari, Coro, Carnegie, and other finer costume jewelry on the Collectics Jewelry , Accessories, and Fine Antiques pages, or search the entire site for great antiques, collectibles, and crafts for every collector!